Runners and walkers are pictured near the center of uptown Hillsboro during a past Dash for DD 5K Color Run/Walk. 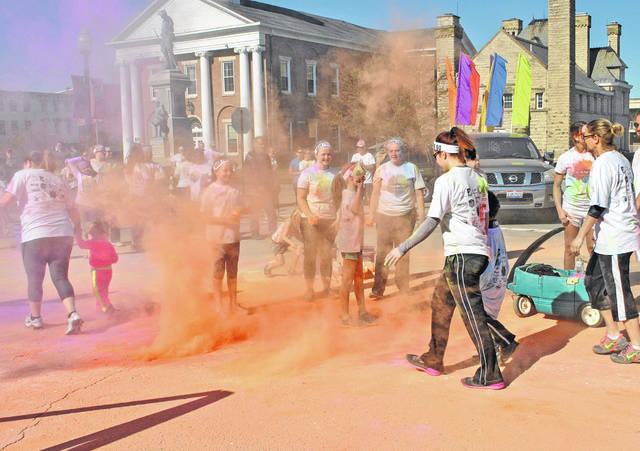 Uptown streets in Hillsboro will be splashed in a rainbow of colors Saturday morning when Highco holds its 5th annual Dash for DD 5K Color Run/Walk. Registration — for those who have not preregistered — starts at 8 a.m. on the back side of the Highland County Courthouse on Governor Foraker Place, where the race begins and ends. The run/walk starts at 9 a.m.
“We put on the race to have some fun and raise awareness for the folks we work with,” said Ciara Garman, marketing director for Highco. She said Highco uses money raised through the run/walk for things Highco needs. Last year it helped purchase a new HVAC unit for a new building, and this year it will be used to help purchase vehicles to take Highco clients where they need to go. “The vehicles help our guys get out the community more, because we want them all to have the same opportunities everyone else has,” Garman said. Garman said vendors will be on hand before and after the race. Community Markets will offer runners/walkers various fruits after the race to help them recover, and Health Quest will offer spine checkups. Depending on the weather, Garman said, the race has drawn 200 to 300 participants each of the past four years. For those that register online before 4 p.m. Friday, the cost to participate is $30 for those 18 and older, $20 for those 6 to 17 years, and anyone 5 and under is free. Visit www.GetMeRegistered.com/HighcoDashforDD to register online. After that and the day of the race, the cost is $40 for those 18 and older, $30 for those 6 to 17 years, and anyone under 5 is still free. Anyone that pays the fee will receive a race T-shirt. Garman said the if the event organizers do not have enough T-shirts for those who register late or on the day of the race, a new order will be placed. There will be awards for first, second and third place overall, and the top finishing female. There will be five color stations along the route where volunteers will toss a nontoxic powder on the runners. But Garman said there will be a place at each color station where can people walk around those splashing colors. She said everyone participating is encouraged to wear white so the the colors show up better. March is Developmental Disability Awareness Month, and Highco said it strives each March to spread awareness. “The dash is in April because we are wimps and March is too cold for us,” a handout for the event said. “We get a lot of support every year and we just want to thank the community, the sponsors and the runners and walkers for everything they do for us,” Garman said. https://www.timesgazette.com/wp-content/uploads/sites/33/2019/04/web1_Color-run-pic-1.jpgRunners and walkers are pictured near the center of uptown Hillsboro during a past Dash for DD 5K Color Run/Walk.